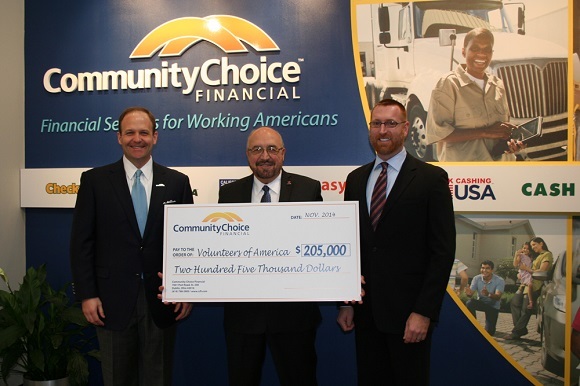 COLUMBUS, OHIO – Community Choice Financial exceeded its goal by raising $205,000 to support Volunteers of America through its Helping Hands Campaign. The campaign contributes to organizations across the country to offer support to vulnerable families, children and seniors. “Our employees are truly dedicated to making a difference and work hard to raise funds for Volunteers of America every year,” said Kyle Hanson, president of Community Choice Financial. “We are honored to support the important work they do to ensure vulnerable Americans have a way to lift themselves up from their current situations and move towards a brighter future. In 2012, Community Choice Financial raised $140,000 through the Volunteers of America Helping Hands Campaign through sales of Helping Hands cutouts that are also displayed at the stores. In 2013, Community Choice Financial raised $170,000, and has set an ambitious goal to raise $200,000 this year. The Helping Hands Campaign is an effort to reach out to the needy with shelters, food pantries, job training counseling, and more. Funds raised throughout Community Choice Financial’s network will not only benefit organizations in Greater Ohio, but other Volunteers of America affiliates across the country. Volunteers of America is a non-profit organization that operates nationwide to provide services to the underprivileged. The organization offers thousands of human services programs, like healthcare and housing. Volunteers of America was established in 1896. The organization is faith based and runs a ministry service that focuses on providing support to vulnerable groups like at-risk youth, senior citizens, those returning from incarceration, veterans, those with disabilities, and those recovering from addictions. Community Choice Financial Inc. Community Cares Program encourages associates to select projects and programs that are important to them and receive paid time off or rewards points to volunteer their time and talents. CCFI focuses on programs that provide financial education and hunger prevention/emergency hunger relief. However, associates give to many causes important to them including organ donation, cancer, heart disease and diabetes. One of the largest recipients of their associates’ generosity is Volunteers of America. Leadership involvement includes but is not limited to the 2015 Central Ohio Heart Walk, the Salvation Army Board, the American Heart Association Board and the Children’s Hunger Alliance. About Community Choice Financial Inc.
Community Choice Financial Inc.™ is a leading retailer of financial services to unbanked and underbanked consumers through a network of over 500 retail storefronts across 15 states and across more than 20 states via the internet. CCFI focuses on providing consumers with a wide range of convenient consumer financial products and services to help them manage their day-to-day financial needs including short-term consumer loans, installment loans, check cashing, prepaid debit cards, money transfers, bill payments, and money orders. For more information on Community Choice Financial Inc. visit http://ccfi.com/.